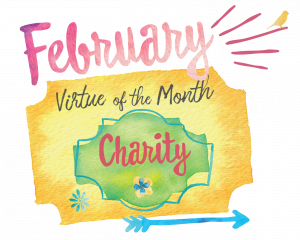 The virtue of the month for Challenge and Conquest in February is charity. Charity is Christian love, seeing people as God does and treating them with the love and respect they need. Charity is like a ripple or wave that gains momentum. The two terms “love” and “charity” are frequently used interchangeably, and with good reason, since the virtue of charity is in fact a kind of love. Charity should be the main identifying element in a Christian. Jesus paints a clear picture of what charity means – feed the hungry, quench the thirst of those who are thirsty for something more, welcome people, cloth the naked, visit those imprison. Serving those who are sick and elderly is an important task for any Christian Catholic. Jesus was the first who showed us with his example how much he cared for those who were alone or ill. The apostles learned from him and passed this along to the first Christian communities. Over the ages, Catholic hospitals and congregations of nuns have been dedicated to serving the sick and the aged. As Catholics, we are pro-life and part of that belief is to care for the elderly and ill. So a visit to a nursing home or helping at a hospital is never a waste of time. It helps us remember what it means to follow in Christ’s footsteps as a Catholic in 2019. Mother Teresa is an incredible example of charity and love for ones’ neighbor. She spent her life serving and defending the poorest of the poor and the sick and lonely. The prayer on the back of the holy card for Challenge this month is one she said often. “Dear Jesus, shine through us. Stay with us and then we shall begin to shine as you shine. 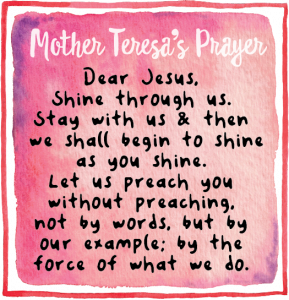 Let us preach you without preaching not by words but by our example, by the force of what we do.” The force that Mother Teresa had was her love and charity. This incredible strength that exuded from her was her charity. 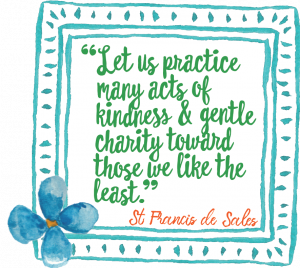 The quote of the month from St Francis de Sales focuses on being charitable with those who have hurt us. He wrote, “Let us practice many acts of kindness and gentle charity toward those we like the least.” Part of Christian charity is loving our enemies. Jesus spoke of it to his apostles as the heroic form of charity. Being nice to people we like or who are nice to us, is not that hard. Being charitable to those people who we naturally don’t get along with… now that is a different story. The Catechism also speaks of charity in .#1844. “By charity, we love God above all things and our neighbor as ourselves for love of God. Charity, the form of all the virtues, “binds everything together in perfect harmony” (Col 3:14).